Giro di Lombardia Saturday. Course details, official startlist, previews and broadcasters now posted. October 3 update: The inaugural Tour of Beijing Oct 5-9 (4-8 in the U.S.), the first ProTour race in Asia. Live video for all stages starting Wednesday (Tuesday in the U.S.). September 6 update: Great video and commentary of Danny's Hart downhill ride at the World Mountain Bike Championships in Champéry, Switzerland. August 20 - September 11 update: The third and final Grand Tour of the year, Vuelta a Espana. Race info, official startlist and worldwide broadcasters for live video and highlights now posted. Monday is the start of the first USA Pro Cycling Challenge from Colorado featuring some of the highest passes in the United States. Race info, official startlist and broadcast details now posted. August 15 update: We're back after camping, hiking and swimming in the Sierra National Forest for a week. 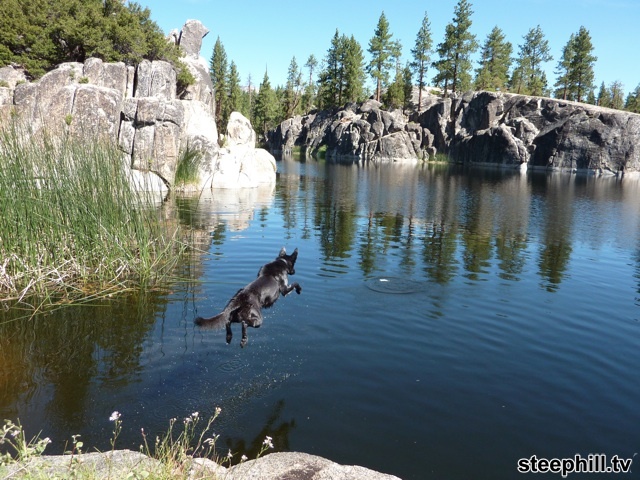 This is our 1.5 year old dog Louis leaping into one of the "best swimming holes" in California (Doris Lake in the Ansel Adam Wilderness). Back to work with Vuelta a Espana and USA Pro Challenge updates coming later on Monday (today). August 3 - 7 update: Also going on this week, the Vuelta a Burgos (2.HC), the warm up race for the Vuelta a Espana, with five stages/days of live video, highlights and photos from northern Spain. July 31 - August 6 update: The Tour de Pologne Live Dashboard (ProTour Poland) with seven stages/days of live video, highlights and big photos. July 29 update: Clásica Ciclista San Sebastián (This Saturday). Course details, official startlist, previews and broadcasters now posted. 2011 Tour de France Live Dashboard: essential mix of race info, previews, live coverage and post-stage media content. Route du Sud 2011 (2.1 French Pyrenees) runs June 16-19. Big photos and video highlights every day. Race info and official startlist now posted. Tour de Suisse 2011 Live Dashboard: race is June 11-19. Live video, big photos every day. Race previews, race info and official startlist now posted. June 5-12 update: Starting Sunday is the 8 day Critérium du Dauphiné from the French Alps. Official startlist, live broadcasters, previews now posted. Daily results, photos, video highlights each day during the race. Skoda-Tour de Luxembourg (2.HC LUX). Results, Photos and Video Highlights each day. May 30 update: Stage maps, profiles and timetables for 2011 Tour de France stages are now posted. May 7-29 update: May is Giro d'Italia month. Official startlist, live broadcasters, stage previews, results, photos, video highlights and more. May 14 update: The Amgen Tour of California starts Sunday with eight stages/days of live video, highlights and big photos. April 26 update: Tuesday is the start of Tour de Romandie (2.HC SUI). Live video, highlights and big photos every day along with the usual race info and interactive startlist. April 26 update: Stage 3 of Tour of Turkey is Tuesday. The race continues through Sunday with live video, highlights and big photos every day. 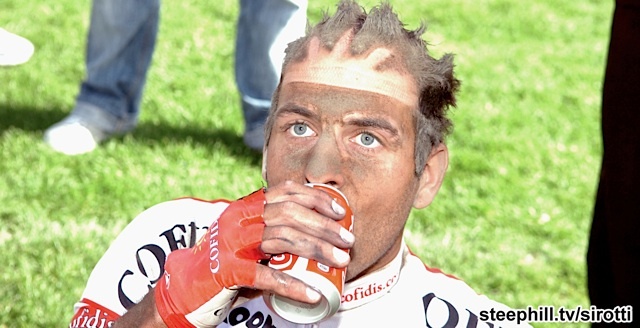 April 21 update: Fleche Wallonne (HIS BEL) post race coverage w/ video hightlights. April 18 update: Giro del Trentino (2.HC ITA) starts Tuesday thru Friday. Amstel Gold Race (PT NED) is Sunday. Post-race coverage now complete. Tro-Bro Léon (1.1 FRA) Sunday. Results and video highlights now posted. April 14 update: Vuelta Castilla y León from Northern Spain continues on Friday with stage 3, the only mountain stage. Live video, highlights and big photos for all five days along with the usual race info and official startlist. Vuelta Castilla y León (2.HC Spain) starts Wednesday. Previews, Startlist, Live Video posted. April 10 update: Paris-Roubaix (HIS France) is Sunday. Completed coverage with results, analysis, photos and video highlights/interviews. April 5 update: Circuit Cycliste Sarthe 2011 (2.1 France) start Tuesday. Race Info and Live Updates. April 3 update: Starting Monday is the next big stage race on the ProTour, Vuelta al Pais Vasco (Tour of the Basque Country) from Northern Spain. Live video, highlights and big photos for all six days along with the usual race info including the official startlist. April 3 update: Tour of Flanders (PT Belgium) is Sunday. Added English 2011 Video Highlights. Gent-Wevelgem (PT Belgium) is Sunday. Critérium International (2.HC France) is three stages over Saturday and Sunday. Live both days. March 21 update: Starting Monday is Volta a Catalunya from Spain, the next WorldTour stage race. Lots of big names will be there including Alberto Contador, Ivan Basso, Igor Anton, Levi Leipheimer and Cadel Evans. Detailed profiles, interactive stage maps, official rosters, and broadcast details now posted. March 8 update: Tirreno-Adriatico starts Wednesday overlapping with Paris-Nice through Sunday. Race previews, official startlist and worldwide broadcasters now posted in addition to the usual race info. March 5 update: Starting tomorrow (Sunday) is the eight stage Paris-Nice from France. Race previews, official startlist and worldwide broadcasters now posted in addition to the usual race info. February 21 update: Starting tomorrow (Tuesday) is the five stage Giro di Sardegna (Italy). It has a great course with three uphill finishes and a strong field consisting of four English-based teams and the best Italian riders. Update Feb 25: This race has been great, two stages remain. Big photos and highlights after every stage. February 19 update: Starting tomorrow (Sunday) is the five stage Vuelta a Andalucía - Ruta Ciclista del Sol from Southern Spain featuring the Schleck brothers, Levi Leipheimer, Sammy Sanchez and Oscar Freire. February 15 update: Oman-Algarve Doubleheader all this week: Starting tomorrow (Wednesday) is the five stage Volta ao Algarve from Southern Portugal marking Alberto Contador's controversial return to cycling. Photos and highlights after each stage. February 14 update: The six-day Tour of Oman 2011 starts Tuesday. Daily video highlights and big photos. February 9 update: Starting today (Wednesday) is the five stage Tour Méditerranéen from Southern France. Photos and highlights after each stage. February 4 update: 2011 Tour of Qatar Live Dashboard: daily live video followed by results and photos starting this Sunday through Friday. February 1 update: The 2011 Paris Nice route was announced today: route map, preliminary stage details inc. some profiles and teams now posted. 2011 UCI Road Cycling Calendar App (beta). The dashboard mothership, tested w/ FireFox, Safari, Chrome; doesn't work w/ IE. January 27 update: The UCI Europe Tour starts Friday from Southern Italy. Race info and coverage details for Giro della Provincia di Reggio Calabria. January 10: All this week, the 2011 Tour Down Under Live Dashboard featuring results, reports, big photos, video highlights and live coverage.